I’ve handled quite a few android handsets in the last couple of months, so it was going to be interesting to see what the Yotaphone 2 had that was going to mark itself above the rest of the competition. Well, that question was answered clearly and promptly; it has a dual identity, a split personality that appealed instantly to the Gemini in me. 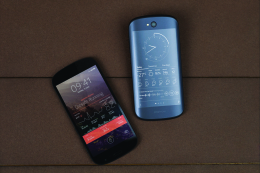 The Yotaphone’s USP is that it has two displays – a full HD 5″ AMOLED one, and a 4.7″, 235ppi one (akin to an e-reader). It runs on Android KitKat, which niggled somewhat as I’m a big fan of Android’s new Lollipop OS, but there are some nice Yota tweaks on board (more on those later). 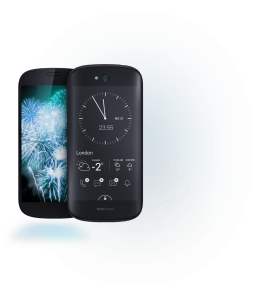 Now, as the name may indicate, the YotaPhone 2 is the second two-screened smartphone of 2014 from the Russian firm, and a substantial improvement on the first. • It measures 144 x 69.5 x 8.9mm and weighs 145g. • The handset has a quad-core 2.2GHz Snapdragon 800 chip, paired with 2GB of RAM. • It possesses 32GB non-expandable storage. • It comes with an e-reading app that you can import e-books into. It’s also important to point out you’ll be parting with around £550 for this device (bearing in mind that you can pick up a sim-free iPhone 6 with 16GB storage for around £539), so what else has it got? if the battery is empty – great for saving on-screen info using the YotaSnap feature if your phone is about to die. This feature had me feeling as though I was responding to message alerts quicker, as I only had to glance at my perpetually activated screen. Another bonus of this feature is the battery lasts almost two days because I felt compelled to take care of most of my smartphone tasks via the far less juice-hungry E Ink side. My favourite function is YotaMirror, which allows you to switch fully functional Android onto the E Ink screen, which, for me, made for much more pleasant, non-backlit reading. Touchscreen functionality remains good on the flip side, but anything like videos (higher refresh rate required) won’t look great, and will kill the battery much quicker. YotaCover and YotaPanels are two other cool features. The former allows you to set the cover image to change at intervals, pulling images from a range of photo sources – Instagram, Facebook and on-device storage included. YotaPanels allows full customisation of your YotaCover using live-updating widgets of various sizes – from recent call list and notifications to calendar, music player, and clock.